Your Guide to places to eat and drink in Berwick-Upon-Tweed. The Town has a wide range of high quality Restaurants, Bars, Cafes and Takeaways to choose from. For such a small town there really is an excellent choice of establishments. Below you will find highlights of some of our preferred places to eat. A full list, along with web links (where available) is provided towards the bottom of the page. If you eat at any of these places be sure to mention where you heard about them! Our Highlighted places to eat are all marked on our interactive map of Berwick Town Centre or Buy a full guide of where to Eat and Drink in Northumberland. This restaurant really is a curiosity! It's like nothing you will have ever experienced before, it's quirky and original. It's so different because literally everything in the restaurant is for sale, not just the food. If you're finding the chair you are sitting on comfortable, or you quite like the miss-matched cutlery... then buy them! The artwork on the walls, the tables and antiques are all available, nothing is sacred here. Cafe Curio has such an eclectic and constantly evolving atmosphere, which is down to the very nature of it's business. The food is excellent quality bistro style, all made with local produce, with perhaps the best dishes being those that use the fresh seafood. There is a set menu in the evening and the only down side is that they don't accept cards, it's cash only so go prepared. This restaurant is located in the Maltings Theatre and Arts Centre and offers lovely views of the Town Centre roof tops, the bridges and the Tweed. As you would expect from an Arts Centre the décor is modern and funky with a slightly cosmopolitan vibe. Please don't assume the restaurant is just there to quickly feed the masses prior to a performance or film at the Maltings (although they do offer and pre-theatre supper menu). I would highly recommend visiting for the food itself as it is more than capable of holding it's own against any restaurant in Berwick in it's own right. If you're just passing through the area go in for a quick coffee and enjoy the views and the laid back atmosphere. Visit their website for more information. This Country Pub/Restaurant is a little outside of Berwick, on the North Road heading towards the Scottish Border. Everything about The Meadow House is traditional and they like to shout it from the roof tops. Traditional locally sourced food, friendly service, traditional décor and best of all good traditional value for money. They serve the classic dishes including prawn cocktail, steak and kidney pie, fish and chips, beautiful home-made desserts and they make them exceptionally well. With this style of cuisine becoming fashionable again, they could do with a megaphone to shout from the rooftops a little louder so that everyone can hear. Visit their website for more information. An Indian restaurant in a converted pub offers a somewhat disjointed location, but since it's recent refurbishment it has become an elegant and relaxing location with high standards of cuisine. It certainly has the best reputation of all the Indian restaurants in Berwick and also offers a takeaway service. Both the restaurant and the wine bar at Foxton's are very popular and offer good quality service. It has a reputation for being one of the more up-market destinations for a drink, with a very well stocked wine bar and an outside courtyard that is a lovely sun trap in summer. The food is also good with a completely locally sourced, home-made menu that includes their increasingly well known "Foxton Steak Sandwich". Visit their website for more information. You won't find food here, but what you will find is an excellent array of fine beers. They offer a number of session beers andlocally brewed ales, you can expect to find such favourites as Timothy Taylor Land Lord, Black Sheep, Spitfire, St Magnus, Wylam Silver Spirit and many more! The Barrels also has a live music venue downstairs with one of the most eclectic line-ups anywhere in the County. Check their website for an extensive list of gigs. Cannon Fish Restuarant - 11 Castlegate, Berwick Restaurant/Takeaway Fish and Chip shop/restaurant also serves pizzas etc. Cashmere Restaurant & Bar - Golden Square, Berwick Public House Contact 01289 302 982. Mr Lee's Chinese Takeaway - 4 Walkergate, Berwick Takeaway Contact 01289 331 238. St Magnus - 25 Main St, Tweedmouth, Berwick Restaurant Contact 01289 302 925. Taj Tandoori - 27 Main St, Tweedmouth, Berwick Restaurant/Takeaway Contact 01289 302 924. 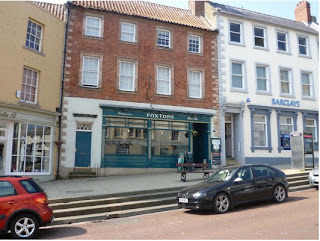 Town House Sandwich Bar - Town House, Marygate, Berwick Cafe Contact 01289 307 904. Villa Spice 2 - Ravensholme Hotel, 34 Ravensdowne, Berwick Restaurant Contact 01289 308 869.